ICC Durban has been voted Africa’s Leading Conference Centre for six consecutive years by World Travel Awards and in 2004 was also ranked as one of the top ten conference centres in the world by AIPC. Its proven track record is unrivalled in Africa. A focal point of the Durban Central business district, the International Convention Centre Durban is a functional space in an aesthetic environment. Centrally located and just a quarter of an hour from the airport, Durban’s International Convention Centre is just minutes from Durban hotels and beaches. Palm trees form a welcoming avenue while at the entrance to the centre three baobabs, Africa’s tree giants, bid a regal greeting. Durban’s International Convention Centre is a purpose-built, fully air-conditioned centre with three convention halls that are interlinked but separate. Moveable walls allow for a number of different venue configurations. Alternatively the halls can be opened up to form one large venue with seating for 5000 delegates or 7000 m² of column free floor space. 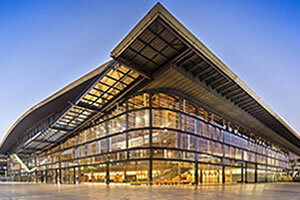 Together with its sister venue, the Durban Exhibition Centre, the International Convention Centre can double its capacity to accommodate 10 000 conference delegates. The centres can function independently or as two halves of one whole. This is achieved by closing Walnut Road, a brick-paved concourse between the two centres, to provide easy access for delegates.